The internet home of "GC"
Yes! 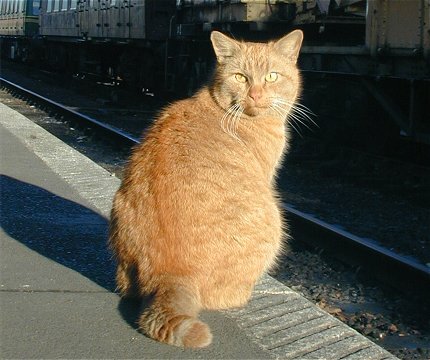 I am the famous 'Ginger Cat' formerly of the Great Central Railway where I managed to keep everyone on their toes until I 'retired' in 2002. That was when I moved in with Graham and Jane at Eaton, near Grantham in Lincolnshire, and enjoyed helping Jane to run the village post office there. Graham and Jane retired from their respective jobs in 2005 and, since that time, I have been helping them to explore Britain's inland waterways on their narrowboat called 'Alnwick'. I do miss all the friends that I made at the Great Central Railway and I am pleased to say that I have finally persuaded Graham to produce a 'gallery' of my railway exploits. The photographs, including the one produced at the top of this page were taken by my friend, Richard Piccaver, a talented artist from Alfreton in Derbyshire. Hopefully, Graham may soon find the time to publish a 'gallery' of my boating exploits. Please follow the link below to find my new 'gallery'. Like all superior beings (cats to you lesser mortals), my favourite occupation is sleeping. I prefer a basket or comfortable bed but any suitable location will do - especially where it causes maximum inconvenience to humans. It always amazes me how humans fail to appreciate the importance of proper rest. They rush about and fiddle with their machines in a most irritating manner! 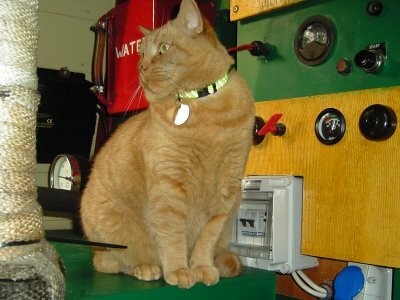 When I am not resting, I enjoy exploring, chasing food and observing human psychology. Humans are curious creatures and careful study of their idiosyncratic habits and eccentric behaviour can be both amusing and educational. This is especially the case when they are involved with railways, canals and other modes of transport! I am perfectly happy living on the boat and I also feel at home when we pay brief visits to 'the house' at Woodford Halse but I am not at all happy with the mode of transport that Graham and Jane choose to get from one to the other. They call it a 'car' but the lack of proper railway lines to guide it means that it depends entirely on the suspect ability of a human to steer it. This in itself would be acceptable if, like the boat, it was limited to a sensible speed but these things can travel as fast as a train! It is a most frightening experience - especially when it seems that the relevant authority has allowed numerous other vehicles to run, at the same time, in either direction - all using the same tracks without the benefit of proper signalling or single line working arrangements. I am quite sure that my old friend John Poyntz, former Principal Inspector of Railways at Her Majesty's Railway Inspectorate (the nice gentleman who brought biscuits for me when I was working with Graham at the railway), would never have allowed such irresponsible working. In my opinion all 'cars' and other vehicles that can be steered by humans should be limited to a maximum speed of four miles an hour. If it is fast enough for narrowboats, then it is more than fast enough for anything else they are allowed to steer! 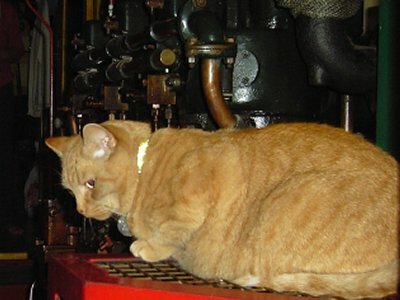 From time to time, it has been suggested by 'other persons' aboard 'Alnwick' that I do not pull my weight as a crew member - I hope the following photographs will help to prove that I do my fair share of duties on the engine room watch - after all, somebody has got to keep an eye on the engine! My further detailed observations and galleries will be uploaded soon!